Where dust has already settled high efficiency vacuum cleaners allow collection with minimal disturbance. For fine and potentially hazardous dusts (including lead, dusts from asbestos containing materials, ceramic fibres etc.) 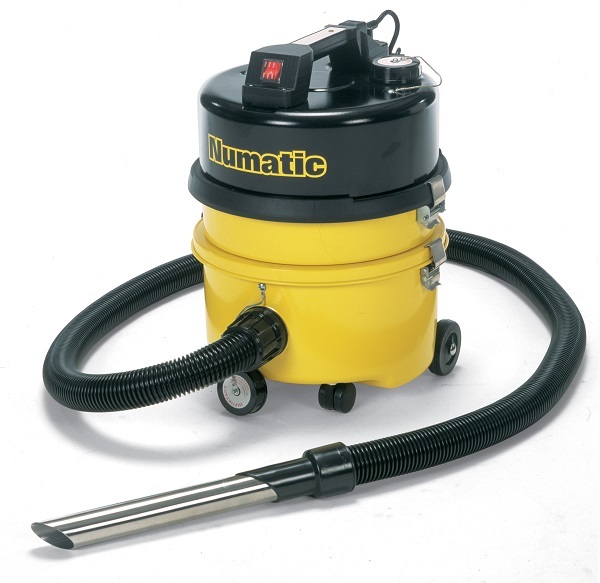 H-Type vacuums are used, constructed to BS5415 and with 3-stage filtration. The final filtration stage incorporates a HEPA (High Efficiency Particle Attenuation) module and each machine is individually tested and certified for filtration efficiency. 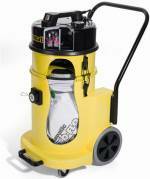 110v machines are standard throughout the hire range but compressed air driven models are available on request. The smallest vacuum in the range, the HZ/Q 250 is light enough to be carried (11.5 kg) but also has castor wheels so it can placed on the ground and pulled around. It has an 8 litre waste container, accepts a Numatic 1B size waste bag, and has a single vacuum motor. The HZ/Q 350 has a larger (10 litre) waste container than the "250"; as standard it comes on a castor base for easy movement (optionally a trolley can be ordered - pictured here). It accepts a Numatic size 2B waste bag, weighs 15kg, and has a single vacuum motor. This model has two motors, developing higher suction capacities - ideal for heavier duty applications and where long lengths of vacuum hose are in use. The HZD/Q 450 has a 20 litre waste container, accepts a Numatic 3B waste bag, and weighs 29.5 kg. It is supplied as standard on a wheeled castor base, but may be supplied with a trolley (shown) upon request. The largest of Numatic's H-Type range this model also has twin motors, and is best suited to heavy duty applications. It has a larger capacity waste container (35 litres) than the 450, accepts a Numatic 4B waste bag, and weighs 30kgs. It is supplied as standard on a wheeled castor base, but may be supplied with a trolley (same as the 450) upon request. * Do not open vacs without respiratory protection equipment. 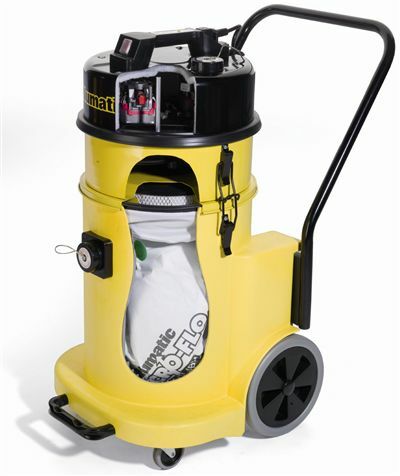 * Ensure outside of machines and fittings are free from contamination before removing from working area. * Seal used hoses and tools in plastic bags. * Never run “H” type vacs when spraying liquids of any type, or use to lift or clean up wet material or surfaces. Full detailed operating instructions and safety precautions are supplied with machines hired from us. * Never run H type vacs when spraying liquids of any type, or use to lift or clean up wet material or surfaces.